Sweet drawing there Charles. Say I've done some Crashs pictures. This one a painting. https://hazartsnrafts.deviantart.com/art/Crash-painting-720281425 and this one a congratulations picture. https://hazartsnrafts.deviantart.com/art/Congratulations-Crash-721496869 I wonder what your opinions are. We love you too, Crash! Hello Hazman! I'm especially impressed with your second one with the Congratulations Crash message. You're a talented artist and thanks for the links to your work. Gabriele and all you're a great crowd! It's been loads of fun interacting with all you cool people on my blog. Will do Gabriele. We'll have fun with other characters. Hazman I was aware that Joe was accepting commissions but hadn't seen them so thanks for the link! 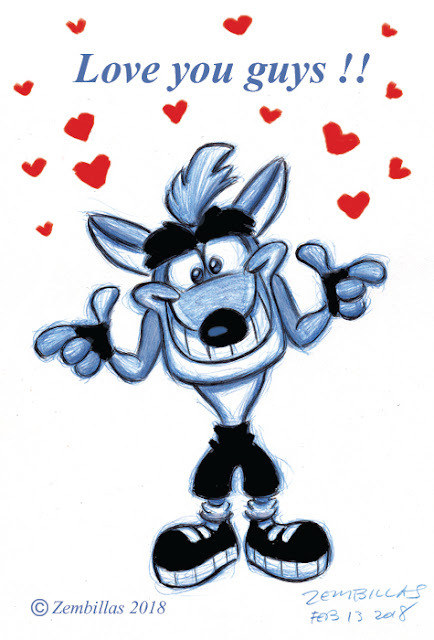 Great to see him drawing Crash. Aww, and we love you too, dear bandiocoot! Many thanks for your amazing work, mr. Charles! I'm a fan of those games and are a treasure from my childhood. High school art - Delacroix's "The Lion Hunt"